Late post! I got home very late, but I thought I'd post anyway. I've also been planning on what prizes to use for the giveaway, so that will be up tomorrow. 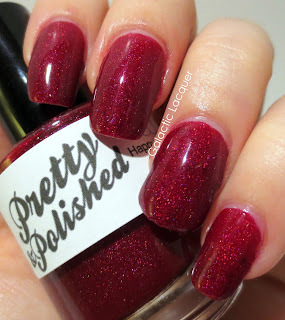 In the meantime, I have a couple incredible holiday polishes from Pretty & Polished, a holiday duo! 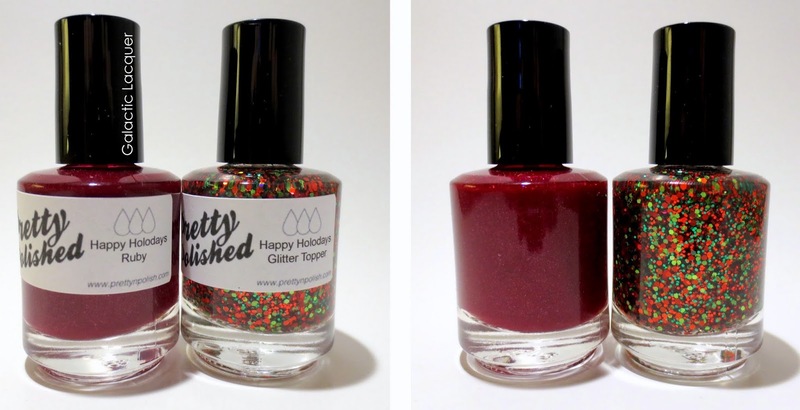 The Happy Holodays polishes are sold together as a duo. They will be available tomorrow, November 9th in her Etsy shop. I know it's still so far from the holidays, but I was already excited to try these polishes out! 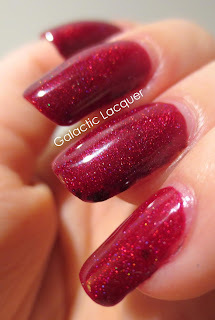 I first went for Ruby, which is a red jelly holographic polish. It is absolutely gorgeous, and reminds me of candy apple paint on cars! 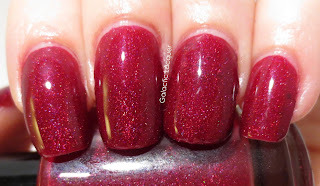 Since it's a jelly, it has some depth to it, but being a deep red, it covers very easily. I used two coats for these photos. The polish is almost a blood red or wine red. It's pretty dark, but lights up a bit when it's in direct light. It looks almost purple when I'm in indirect lighting, but bright red right under lights. 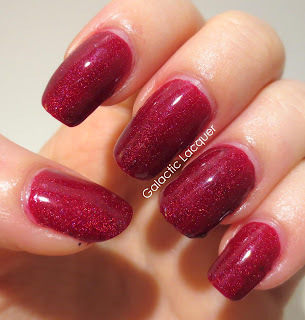 Ruby applied wonderfully - super smoothly. And I just can't get over how holographic it is! It doesn't have the very obvious rainbow like some other holographic polishes, but it is filled with tiny holographic flecks, and you can really see them shift from green, to orange, and more in the light. 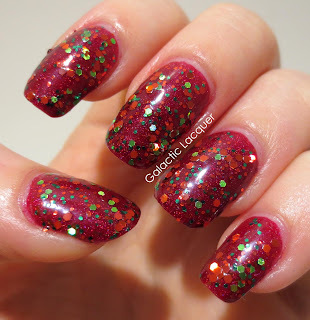 I then topped Ruby with the glitter topcoat, which is called Glitter Topper. This polish is absolutely perfect for Christmas and the holiday season. While it is "Christmas colors," red and green, it also reminds me holly berries and wintertime in general. 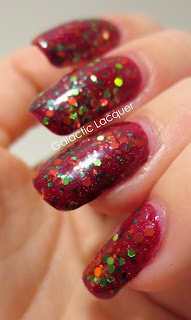 Glitter Topper is a clear base with lots of reds and greens in it. It has holographic bright red hexes, and holographic light green hexes. In between, it also had darker, smaller green hexes, and smaller red hexes as well. 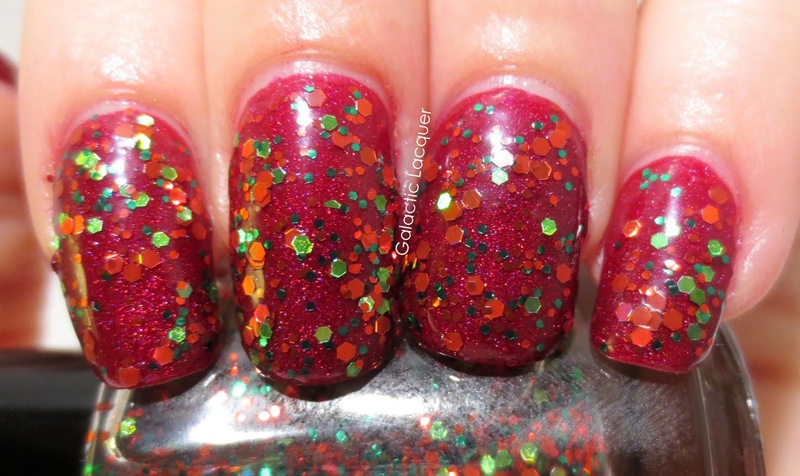 I love how this polish has bright red instead of deep red, since it allows the glitter to really pop on top of the deep red Ruby base. The glitter is also holographic, so it catches the light and makes the red pieces shine bright orange, and the green shine yellow. The holographic pieces also remind me of holiday lights when they shine different colors. It makes it look like the topcoat has a lot more colors than just red and green! I tried to get a photo of my nails at different angles and slightly out-of-focus to show the holographic bits. The Happy Holodays duo will be available in Pretty & Polished's Etsy shop beginning tomorrow. A full size set will be $15. The polishes come together, so you can create this wonderful combination yourself! I will be using these two so much more this holiday season. They look gorgeous~!! 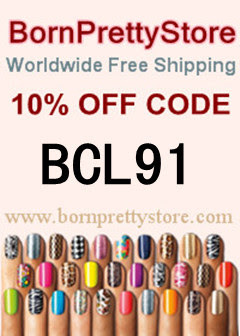 SO many pretty collection coming out for Christmas... So many choices to make ~~! !